The 17th hole at TPC Sawgrass might be the most famous golf hole in the United States, but there is another on the other side of the country that rivals it, and in terms of excitement, knocks it out of the park. That would be No.16 at TPC Scottsdale, which players on the PGA Tour will tackle it this week for the playing of the Waste Management Phoenix open. Playing just 162 yards, for the four or five seconds that the golf ball is in the air, thousands of fans sitting and standing around the stadium-like atmosphere on the shortest hole on the golf course scream and yell at the top of their longs. Is it a golf tournament or a football game? On the 16th at TPC Scottsdale, sometimes it sounds like it could be either one. This week, players will be hitting anywhere from a pitching wedge to an 8-iron depending on where the PGA Tour decides to put the tee and the flag. But players will be going at the flag regardless, because they have a short club in their hand. Throughout the years, the reputation of the crowd and atmosphere at no.16 has only grown. Players reach that tee box and know what is about to take place the second they strike the ball. And on the weekend, especially late on Sundays when the tournament is on the line, it’s arguably the most intimidating golf hole on the planet. If you are a fan who has not yet seen No.16 at TPC Scottsdale, be sure to check in and tune into Golf Channel for Thursday and Friday coverage, or on CBS for coverage over the weekend. It is a spectacle that you do not want to miss. 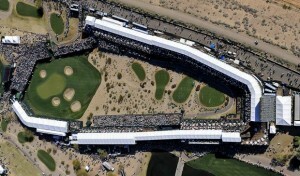 This entry was posted in Opinion and tagged tpc scottsdale, waste management phoenix open on January 30, 2013 by Bryan.